This free startup WordPress theme has clean design and professional built to invite and impress visitors at the very first sight and instil their trust on your services by showcasing your expertise in the best way. It is a modern theme which is built in a way to be used for multiple purposes whether you want to use it for corporate company, IT Startup Company, joint venture, entrepreneurship, online business or any other type of business. 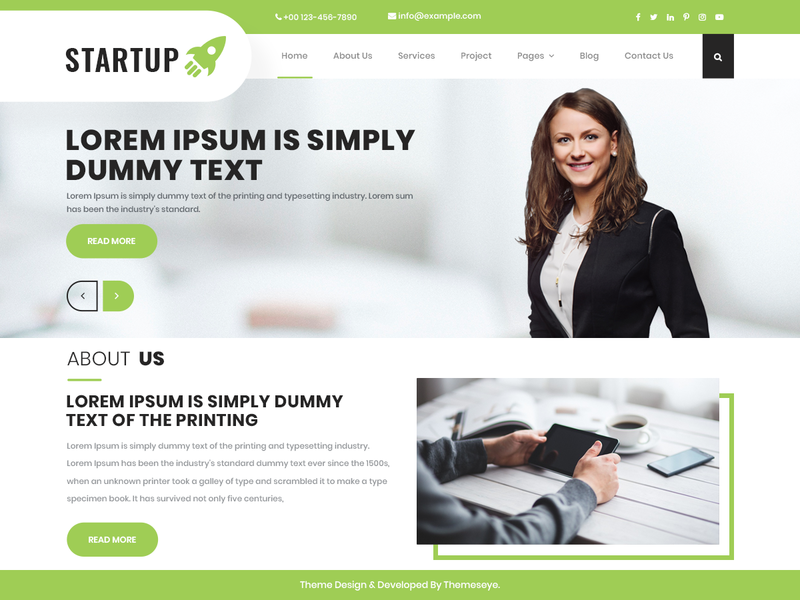 This free startup WordPress theme is responsive to its deepest core, compatible on all browsers and can be translated into as many as 70+ languages. It is so well coded with proper comments and minimal, bug-free code that if you are a programmer yourself, you will find the code very simple to understand and absolutely easy to tweak its CSS/JS. The free startup WordPress theme is designed with the new WordPress version so it is updated and your website will work fine for years to come. Its SEO is well working to bring good traffic to your website. It is fully compatible with third party plugins along with integration to WPML and WooCommerce. Because of its WooCommerce compatibility, you can set up your online store to display products in beautiful layouts and get all the features of an online store. It has well-articulated documentation so using this free startup theme is not a problem for WordPress newbie and professional coder both.